An Apache-operated wildcat in the frontier Offshore Canning Basin has broken a 15-year drought in major oil discoveries in Australian waters. The Offshore Canning Basin sits between the Carnarvon and Browse Basins off Australia’s north-west coast. Remarkably, only a dozen or so wells have been drilled in the basin since exploration began in the 1960s, despite it being nestled between two of Australia’s most prolific petroleum basins. It is the first major offshore oil find in Australia since 1999, when Woodside Petroleum established a new deepwater oil province off the North West Cape, about 600 km further south in the Carnarvon Basin. Apache and its partners Carnarvon Petroleum (20%), Finder Exploration (20%) and JX Nippon (20%) had actually targeted gas at Phoenix South-1, based on the results of two nearby wells drilled by BP in the early 1980s. However, the discovery of oil has heightened suspicions that BP misdiagnosed what it had found with its first well, Phoenix-1, in 1980, when it ran into problems and was unable to recover samples or conduct a drillstem test. It found hydrocarbons over a large column, but without the ability to conduct a proper test concluded it merely had gas shows. A second well, Phoenix-2, was drilled in 1982, but the reservoir quality was poor and the BP campaign ended. The Apache team and geologists at Carnarvon Petroleum, which identified the prospect and led a farmout to Apache and JX Nippon in 2012, are now going back to the BP drill results to see how well they match with the new discovery. The discovery has caused a lot of excitement in the Australian upstream industry, and not just because oil discoveries have been so few and far between. Phoenix South-1 has uncovered an entirely new oil play in the Lower Triassic Keraudren Formation, and is the only well in the history of the Offshore Canning to successfully test this sequence. More importantly, Phoenix South-1 has busted a long-standing myth that the Outer Canning Basin is not prospective. Previous explorers had tried to import the exploration model that worked so well next door, targeting reservoirs in younger Triassic and Jurassic rocks. 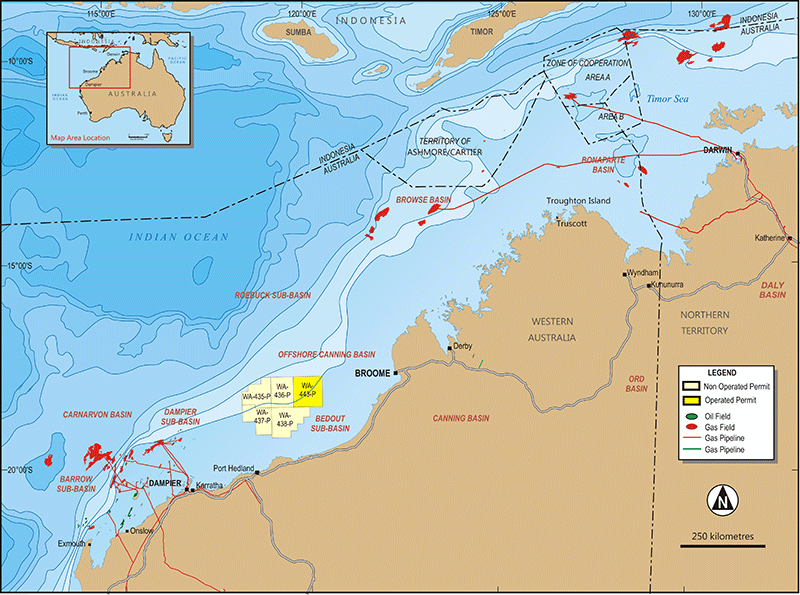 In the Carnarvon Basin and Browse Basin, this approach had yielded giant gas fields that support most of Australia’s west coast LNG projects. When previous explorers failed they concluded the Outer Canning had simply missed out on the rich petroleum endowment that blankets the rest of Australia’s north-west continental shelf. It was an easy conclusion to make because the Outer Canning is something of an oddity. Its neighbors on either side share broadly the same structural setting and depositional history from the separation of India from Australia. However, the Outer Canning had distinct differences, despite being wedged in the middle. The Phoenix South-1 is a much-needed boost for Apache, which has a long history of success in Australian waters but recently flagged a sell-off of its Australian assets due to investor pressure back in the US. It also sent Carnarvon Petroleum’s share price soaring. Another beneficiary of the discovery is Woodside, which followed Carnarvon Petroleum into the Offshore Canning and has since made a huge plunge into the frontier with Shell. The joint venturers conducted Australia’s largest offshore 3D seismic survey in the Offshore Canning in 2011, and committed to an eight-well wildcat program. The first well of a two-year, $US442 million contract, Hannover South-1, is due to spud in the current quarter. Meanwhile, Apache and its partners are still unwrapping the good news from Phoenix South-1. Side-well cores will be assessed as soon as possible to provide definitive data on the quality of the reservoirs. Apache has already taken up an option from Carnarvon Petroleum and Finder Petroleum for a 40% stake and operatorship in neighboring permits WA-436-P and WA-438-P. It has also committed to drill a second well next year at a larger prospect known as Roc, closer to the coastline in permit WA-437-P. The Keraudren Formation is shallower and less compacted at Roc, and is also believed to be sandier as it moves inboard. It will be one of the most anticipated wells in recent Australian history.